Material taken from "Forts on the Pennsylvania Frontier, 1753-1758" pages 79-97, by William A. Hunter, The Pennsylvania Historical And Museum Commission, Harrisburg, Pennsylvania, 1960. Fort de la Riviere au Boeuf, the second French fort in Pennsylvania stood at the site of the present Waterford, Erie County, and in the state of Pennsylvania. 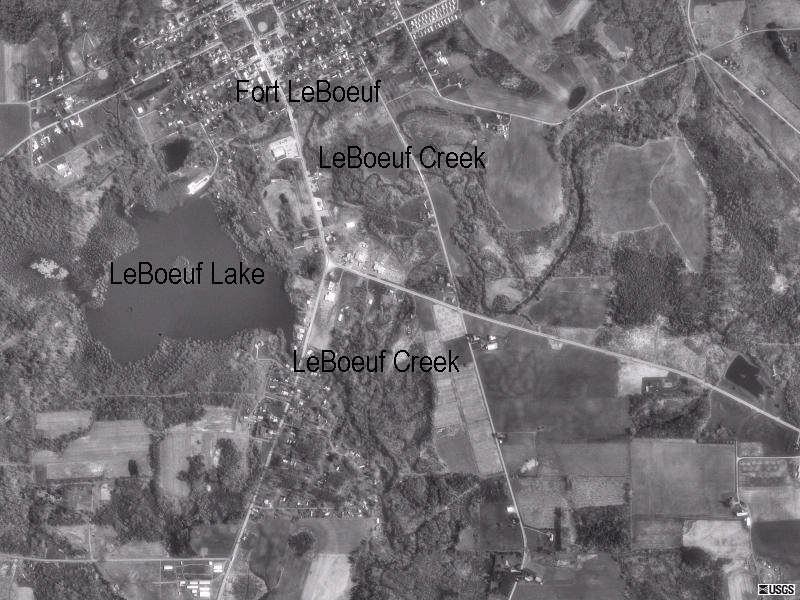 It took its name from that of the stream, now called LeBoeuf Creek, on which it stood.87 It was the first fort on the waters of the upper Ohio, and it and Fort de la Presqu'isle guarded the two ends of the Presqu'isle portage. Begun in July 1753, it was garrisoned until August 1759. 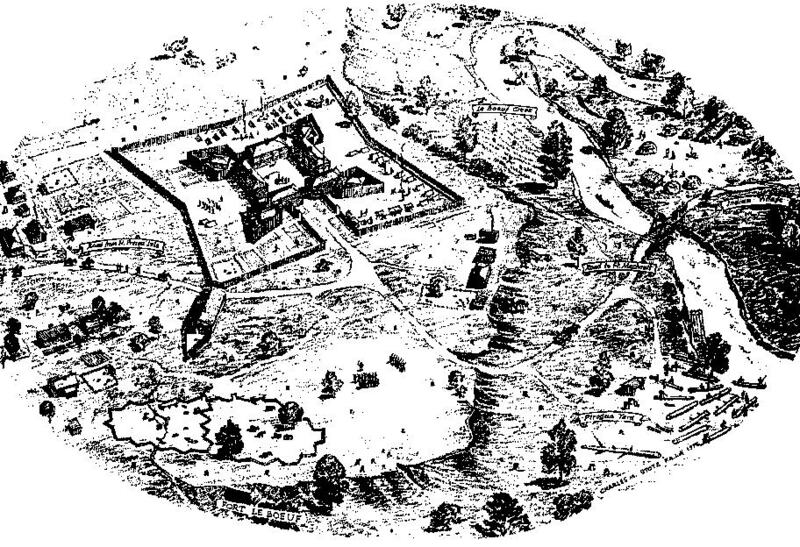 Contemporary descriptions show it to have been a square fort with bastions at the corners, similar to the fort at Presqu'isle, but smaller Barracks and other buildings formed the four sides of the square, and a guardhouse, a chapel, an infirmary, and the commander's storehouse occupied the bastions. This fort had only one gate, however, and the outer wall was a palisade of upright posts, in contrast to the horizontal timbers of Fort de la Presqu'isle. Once established at Presqu'isle, the French lost little time in opening the portage from that place to the waters of the Ohio and in establishing their second post at the southern end of this portage. Besides these two tasks, they had also to build boats and to clear the Riviere au Boeuf (French Creek) for navigation; then they would have to transport a great quantity of supplies over the portage before the troops could re-embark and descend the Riviere au Boeuf and the Belle Riviere (the Allegheny or the Ohio) to Chiningue (Logstown), where they planned to build Fort Duquesne. It is clear from the sequel that these Indians were in fact somewhat perfunctory in their inquiry concerning French motives and that they responded readily enough to Marin's show of friendship. As surviving descriptions show, the Governor's advice was followed. Captain Jean-Daniel Dumas commanded at the Riviere au Boeuf less than a month. In part at least, this was because of Marin's temper, none the better for a trying assignment and bad health. Coffen, who had served under Marin, described him as "a Man of a very peevish cholerick Disposition"; and Governor Duquesne wrote after Marin's death of "his impetuous nature which a mere trifle could set in motion. "101 On August 26, it appears, Marin received from Dumas a letter which, among other matters, seems to have spoken of the demands on Ensign Drouillon and to have hinted at dissatisfaction on the part of some of the officers. Since Repentigny seems to have been at Presqu'isle, it is uncertain what officer was in charge at the Riviere au Boeuf during November; and few incidents pertaining to the fort can be assigned to this time. George Washington's journal reveals that a party of seven "French Indians," who on October 26 attacked the home of Thomas Cooper on the South Branch of Potomac and carried off his eleven-year-old son, returned this way while "Capt. Riparti" was in command.l16 One of Governor Duquesne's later letters asserts that ''as early as the month of November, 1753, Sieur de la Chauvignerie with thirty men was detached from the fort of the Riviere au Boeuf to go and establish himself at Chinengue, a village of the Cha8anons. "117 Neither of these matters is of high importance, however, since it is known that La Chauvignerie did not actually go to Chiningue until January, 1754. Only a few days after Saint-Pierre's arrival at Fort de la Riviere au Boeuf, Major George Washington appeared there on December 11 to deliver Governor Dinwiddie's message demanding by what authority the French had established themselves on Virginia territory. Accompanying Washington and his white companions was another embassy, composed of four Ohio Iroquois (three chiefs and a younger hunter) , and an officer and three soldiers who had escorted them from Venango. Saint-Pierre's reply to Dinwiddie, dated December 15, was simple and direct. Any dispute over land must be settled by those who had authority to do so; as commander, Saint-Pierre would obey the orders of his general-that is, of Governor Duquesne-to whom he would forward Dinwiddie's letter. Saint-Pierre received the Indian embassy on December 14. The three chiefs-the Half King Tanaghrisson, Jeskakake, and Kaghswaghtaniunt -had come to break off relations with the French by returning the wampum "speech belt" which Marin had given Scarroyady in July. Saint-Pierre declined to accept this belt and, in contrast with Marin's brusque treatment of Tanaghrisson in September, attempted to win the Indians with liquor and gifts. The chief Officers retired, to hold a Council of War, which gave me an Opportunity of taking the Dimensions of the Fort, making what Observations I could. It is situated on the South, or West Fork of French Creek, near the Water, and is almost surrounded by the Creek, and a small Branch of it which forms a Kind of an lsland; four Houses compose the Sides; the Bastions are made of Piles driven into the Ground, and about 12 Feet above and sharp at Top, with Port-Holes cut for Cannon and Loop-Holes for the small Arms to fire through; there are eight 6 lb. Pieces mounted, two in each Bastion, and one Piece of four Pound before the Gate; in the Bastions are a Guard-House, Chapel, Doctor's Lodging, and the Commander's private Store, round which are laid Plat-Forms for the Cannon and Men to stand on: There are several Barracks without the Fort, for the Soldiers Dwelling, covered, some with Bark, and some with Boards, and made chiefly of Loggs: There are also several other Houses, such as Stables, Smiths Shop, &c.
Contrecoeur had to wait the opening of travel before moving from Niagara to Presqu'isle (by the beginning of March) and across the portage.124 About the middle of March he arrived at Fort de la Riviere au Boeuf and relieved Saint-Pierre.125 Le Mercier, who had led the vanguard of the troops from Montreal, joined Contrecoeur on March 20;126 by March 29 Contrecoeur had gone down the Riviere au Boeuf, and Le Mercier was about to follow with the rear guard.127 Shortly thereafter, beginning about Easter (April 14) , additional detachments under Captain Pean and others set out from Montreal to rendezvous at Chautauqua. We were 8 days employed in unloading our Canoes here [at Presqu'isle] & carrying the Provisions to Fort Boeuff, which is about 6 Leagues from Fort Prisquille at the head of Buffaloe River. As has been noted in the account of Fort de la Presqu'isle, the year 1755 was marked by the effort to reinforce Fort Duquesne to withstand the expected attack by English forces under General Braddock; and it became the chief responsibility of Lieutenant Benoist at Presqu'isle and Ensign Saint-Blin at Riviere au Boeuf to dispatch the men and supplies forwarded from Niagara by Lieutenant Boucher de Laperiere and commanded by Captain Lienard de Beaujeu, who had been designated to succeed Contrecoeur in the command of Fort Duquesne. Fort de la Riviere-au-Baeuf. The Fort de la Riviere-au-Boeuf, a square fort, palisaded, situated thirty leagues from Fort Machault, on the river whose name it bears. This river is very navigable in spring, fall, and often even in winter; in summer the water there is very low, it is necessary to tow in many places. In another passage De Bougainville refers to this post as "Fort de la Riviere-au-Boeuf or Fort Royal";147 but this latter name does not appear in other documents. With the French retreat from Fort Duquesne to Fort Machault toward the end of November of this year and the establishment of an English garrison at Pittsburgh, the area about Riviere au Boeuf became more liable to annoyance by scouting parties and spies. In February, 1759, a wagoner at Fort Machault was carried off by a Pennsylvania officer and a party of Delaware Indians from Fort Augusta.151 In March a Delaware Indian came here, spying for Colonel Hugh Mercer, who commanded at Pittsburgh. Both men gave information, which may serve as examples of the data sought and given in these exchanges. At Pittsburgh on August 16 a Delaware Indian who had been at Venango reported "that as soon as letters were brought to that Post of the fall of Niagara, the Garrison set fire to the fort, and upon their arrival at Le Beuff & Priscile, both these were demolished in the same, "Manner";160 and the approximate date of this destruction is set by another report that the French had left Venango on or about August 6.161 Saint-Blin himself served afterward in the defense of Montreal, whose surrender on September 8, 1760, brought to an end the war in Canada. 85.Vaudreuil to the Minister of the Marine, June 24, 1760, Wilderness Chronicles, 167; also translated in NYCD, X, 1093-94. 86 Tanguay (ed.) Dictionnaire genealogique, VII, 10: "il etait, le 13 Oct. 1759, au Detroit." 87. The French regarded LeBoeuf Creek as the head of the stream now call French Creek, called by them Riviere au (x) Boeuf (s) The name French Creek appears under date of August 7, 1753, in William Trent's journal (History Bouquet,25) and in John Fraser's letter of August 27 (CR, V. 659) Washington who used the name in his journal of 1753-1754, may have learned it from Fraser . 88. Duquesne to Marin, July 10, 1753, replying to letters of June 20-27, ASQ, V-V, 5:62:6. 89. PR, M, 306; printed in CR, VI, II. The statement that the meeting took place at the fort is of course anachronistic, for the fort was not built there until later. 90. Marin to Contrecoeur, Fort de la Presqu'isle, ASQ, V-V.l: 64. 91. Id to id., Fort de la Presqu'isle, July 15, ibid., 1:65. 93. Seemingly Pierre-Louis Boucher de Niverville, sieur de Montizambert, the Boucher being interpreted as bouchlfe, mouthful or bite. Coffen evidently had an imperfect knowledge of French, and his representation of names and events is imprecise. 94. PR. M, 306; printed in CR, VI, 11. 95. NYCD, X, 256; reprinted in PA2, VI, 162-63 (1877 ed.) and in Wilderness Chronicles, 51. 96. Trent's journal, History of Bouquet, 25-27. 98. ASQ, V-V, 4:~79k; copy in 5; 61:12b; "Upon your arrival I count on your coming to the Fort de la Riviere au Boeuf, so that we shall confer there." The date is indicated also by references to the reconciliation with Dumas. 100. Marin to [Montesson], ibid. ; id. to Dumas, August 26, 1753, and Dumas to Marin. August 27, Papiers Contrecoeur, 42-43, 46-47. For Charles Chaussegros de Lery, see BRH, XL (19~4), 585. The editor of Papiers Contrecoeur, 46, n.3, credits the elder brother joseph-Gaspard with this work. 101. Duquesne to Contrecoeur, December 24, 1753, Papiers Contrecoeur, 86. 103. Dumas to Marin. Camp de la Riviere au Boeuf. Ibid. 46-48; Marin to Dumas, ASQ, V-V, 4:379b (copy in 5:61:9b); id., to Boishebert, ibid., 4:379n (copy in 5:61:10b). 104. Ibid. 4:379k; copy in 5:61: 12b. Undated but evidently written in early September 1753. 107. Marin to [ ], n. d., ibid., 4:379t; copy in 5:61:13b. 109. 0ctober 14, 1753,Papiers Contrecoeur, 74. 111. Duquesne to the Minister of the Marine, November 2, 1753, Wilderness Chronicles, 58-60. 113. Duquesne to Saint-Pierre, December 25, 1753, Papiers Contrecoeur, 88. 114.Id. to the Minister of the Marine, November 29,1753, Wilderness Chronicles, 60. 115. Lambing (ed. ), Baptismal Register of Fort Duquesne, 40-43. English translation also appears in Frank H. Severance, An Old Frontier of France, II, 23-24. 116. Journal of Major George Washington, 9, 18. For reports of the Indian attack, see Pennsylvania Gazette, December 27, 1753; February 26, 1754. 117. Duquesne to the Minister of the Marine, October 12,1754, Wilderness Chronicles, 82-83; the French text is quoted in Papiers Contrecoeur, 79, n. 4. Duquesne is attempting to represent the French "fort" at Chiningue as antedating the English post begun by Trent in March. 1754. 118. Duquesne to Saint-Pierre, December 25, 1753, Papiers Contrecoeur, 87-88. 119. Duquesne orders to Contrecoeur, ASQ, V-V, 3:179. Duquesne's orders of the same date to Saint-Pierre are in Papiers Contrecoeur, 89. 120. Journal of Major George Washington, 16. 122. Duquesne to Saint-Pierre. January 30, 1754, Papiers Contrecoeur, 98. 123. Id. to Contrecoeur, ibid. 92-96: orders, ibid., 96-97. 124. Bigot to Contrecoeur, March 2, 1754, ASQ. V-V, 4:341. 125.. Id. to id., April 15. 1754. acknowledging letter of March 15. Papiers Conttrecoeur, 113; Contrecoeur to Madame Contrecoeur. Fort de la Riviere au Boeuf, March 19, ibid. 110-11. 126. Duquesne to Contrecoeur, April 15. 1754. ibid., 114. 127. Id. to id., May 9, 1754, ibid., 123. 130. Dery journal, RAPQ, 1927-1928, p. 366. 132. De Lery journal. RAPQ, 1927-1928, p. 372. Saint-Blin's copy of Le Borgne's orders was made July 7, Papiers Contrecoeur, 207. On July 10 Le Borgne was at Chatakoin. 133. De Lery journal, RAPQ, 1927-1928, pp. 383, 385. 134. Maryland Historical Magazine, IV (1909) , 274. 136. Pean to Contrecoeur, ibid., 210. 137. Id. to id., ibid., 215. 138. De Ury Journal, RAPQ, 1927-1928, pp. 381-87. 140. Letters of July 18 and 25, ibid., 219, 223. 143. Saint-Blin to Contrecoeur, Papiers Contrecoeur, 417. 144. Memoire pour le sieur Duverger de Saint-Blin ..., 4. 145. Vaudreuil to the Minister of the Marine. Wilderness Chronicles, 99; there is another translation in NYCD, X, 580.84. Montcalm Journal, 201, seems to refer to the same incident as reported in a letter of April 15, 1757. Here, however, the officer's name appears, perhaps in consequence of a misreading, as Saint.Clair Duverger. 146. RAPQ, 192J-1924, p. 48; compare the translation in PMHB, LVI (1932) , 62. 147. RAPQ, 192J-1924, p. 54. 149. PPC; printed in PAl, Ill, 305. and in Wilderness Chronicles, 116. 150. Vaudreuil to the Minister of the Marine. ibid., 113. 151. ld. to id., March 5, 1759, ibid., 138; Pennsylvania Gazette, Apri15, 1759. 152. Amherst Papers, PRO 273, WO 34/33. f. 16 (Library of Congress copies) . "Martin Woolley" and young La Chauvignerie were later exchanged under a flag of truce of April 28, 1759. Register of Flaggs of Truce &c. in Papers of the Provincial Secretary. Public Records Division. 153. PR, Q, 442; printed in CR, VlII, 312-13. For another copy, see Coi. Bouquet Papers, Ser. 21644, Vol. I, 86; printed also in Wilderness Chronicles, 152. 154. Lambing (ed. ), Baptismal Register of Fort Duquesne. 156. Pouchot Memoir, I. 156. 157. Thomas Lloyd to John Stanwix, May 25, 1759. Col. Bouquet Papers"., Ser. 21644. Vol. I, 149. 158. Pennsylvania Gazette, May 3. 1759. See also. Roll of the Men Killed in the Battoe 28th March, 1759. PA5, I. 275. 159. .Memoire pour le sieur Duverger de Saint-Blin ..., 4. 161. Intelligence enclosed with Hugh Mercer to Governor Denny, August 13, 1759, CR, VIII, 395. 162. Col. Bouquet Papers, Ser. 21644, Pt II, 168.